Ligulariabelongs to the family of Asteracea. The name Ligularia can be traced back to the Latin name ligüla, a diminutive of lingüa which means tongue. It alludes to the fact that the capitulum(flowerhead) carry linguiform(tongue-shaped) ligulate(strap-shaped) edged flowers. Ligularia formerly was named: Senecio…common groundsel. Senecio derives from the Latin word senex which means greybeard or old man. It hints at the soon showing white fluff(fruit pappus) after flowering and very probably as well to the bald top of the common receptacle. According to old and new literature, the genus Ligularia exists of 150 species. Most of them are native in China; Japan; Korea and Siberia. Within the scope of this article it is of course no use to describe all the species in question. Ligularia clivorum; dentata; hessei; hodgsonii; intermedia; japonica; macrophylla; palmatiloba; przewalskii; siberica; speciosa; stenocephala; tangutic etc.. Practically all the varieties are deciduous plants and fully hardy except Ligularia tussilaginea aka Farfugium japonicum(Senecio kämpferae) This specie is a non hardy“evergreen” one. The yellow spotted glossy leaves variety Aureomaculata and the white spotted leaves variety Argenteaalready were exported from Japan to Europe in 1855. It were beloved indoor plants for a long time .They have leathery, kidney-shaped leaves and branched flower stalks in Summer with yellow flowers. The variety Crested Leopard has leathery, spotted leaves but with crested edges. Ligularia Cristata has grey crested leaves with pink highlights. Ligularia dentata DESDEMONA. Blooms in late Summer with Golden-yellow flowers. Ligularia przewalskii….cutleaf Ligularia. This particular species has very deeply cut foliage with black stems and tall yellow flower spikes. It originates from Northern China. It is named in honour of Nicolai Mikhailovich Przewalski (1839-1888) celebrated Russian explorer of Central Asia. The firsteye-catching new hybrid is Ligularia Little Rocket a dwarf form of Ligularia The Rocket. It shows yellow, conical flower clusters. Ligularia Little Lantern. This is a top variety. It is a dwarf hybrid, with large, bright yellow, conical clusters of daisy-like flowers over rounded, kidney-shaped foliage. It is an easy grower. Ligularia Little Lantern is bred by the German nurseryman Helmut Stade. His nursery is said to be a locally operated family business with a national reputation. The nursery , located in the small town Borken-Marbeck, not far from the Dutch border, is a real gardeners paradise where approximately 3000 varieties of perennials are grown. Ligularia Little Lantern is more drought tolerant than other Ligularia varieties and that’s why it is more adaptable to different growing conditions. It can be grown on the balcony in pots and as a “patio” plant. LIGULARIA BRITT MARIE CRAWFORD. It is named after the late Mrs. Britt Marie Crawford beloved wife of Captain James Crawford. James who served the English army, was a Captain of an infantry regiment. In this capacity he served his home-country in India for a period. When he retired he became the owner of a huge country estate, surrounded by plenty of farm land, in the neighbourhood of the Scottish city Edinburg. James did not like farming himself at all. He leased out his farm land and being a “man of the world” and no Landlord, he became a corn merchant and started buying grains in Argentina in favour of farmers in Scotland and England. It was on the country estate of her husband James where Britt Marie(originated from Norway) started a little nursery and a small garden-centre for private sales. And it was at this nursery that Britt Marie discovereda nearly black leaved Ligulariabetween her Ligularia dentata seedlings. It was in 1998. Unfortunately, she passed away a couple of months after she had found it. At that time, Captain James Crawford met with the very famous English perennial grower, Mr. Bob Brown from CotswoldGardens. Bob recommended James to contact Mr. Luc. Klinkhamer, the world-wide known Dutch perennial specialist, for distributing the new Ligularia variety. In honour of his wife, James decided to name the variety BRITT MARIE CRAWFORD. Luc got the exclusive rights to distribute Ligularia dentata Britt Marie Crawford world-wide. The variety is patented. A part the royalties to be paid are collected in favour of a Scottish Cancer Fund. 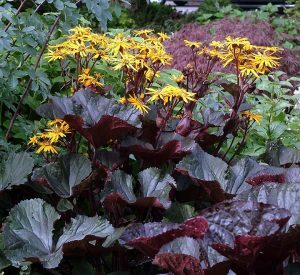 Ligularia Britt Marie Crawford has deep dark, glossy maroon foliage. It emerges the darkest of all Ligularia’s but it also remains dark for most of the season. The yellowish-orange flowers bloom just above the foliage in late Summer. Ligularia dentata Britt Marie Crawford is a “must have” in the garden! The garden of Britt Marie does not exist any more. Good old James himself still is active as a “corn merchant”. In a lovely village, namedSt. Thomas de Joliette and located in the CanadianProvinceQuebec, you may find the nursery of Serge Fafard. The nursery was established in 1983. The total area is 30.000 square meter. Besides the nursery, a greenhouse of 10.000 square meter is situated on this territory as well as an unique and famous show garden. It attracts each year plenty of visitors. 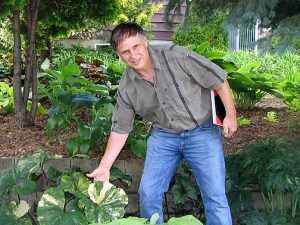 When Serge started his nursery, he, in particular was busy with breeding Hosta and Iris. Both the genera are extremely popular all over the Americas and Canada. European nurseries still benefit of Serge’s efforts. 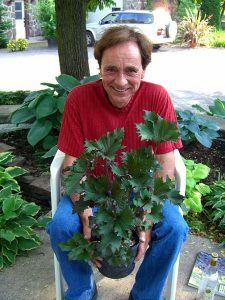 Serge’s interest in Ligularia began in 1992. The Canadian Winters are extreme and very cold…..minus 25-30 degrees Celcius and just in this kind of climate Ligularia was and is doing well. He noticed to his surprise, that hardly no one had started breeding seriously with Ligularia. During one of his trips to Europe he bought as many as species of Ligularia he could and began breeding scientifically in 1995. Nowadays, in 2008, he has hundreds of very promising new seedlings and varieties in all kind of leave shapes and colour variegations. Being quite critical, Serge waited till 2006 before introducing his varieties world-wide. Leading American companies such as Terra Nova; Plant Haven etc. approached Serge to be licensed to introduce the OSIRISLIGULARIARANGE, but after having talked to Mr. Luc. Klinhamer, Serge decided to let the CNB Greenteam introduce the Osiris range of Ligularia structurally world-wide. The first matter of importance is not to glut the market with too many new varieties, but to introduce one or two varieties yearly. In 2007 LIGULARIA OSIRIS FANTAISIE has been introduced. It is the result of crossing 5 different species with each other. Which ones remains Serge’s secret of course. The leave shape is totally new in Ligularia. The introduction of LIGULARIA OSIRIS CAFÉ NOIR and LIGULARIA OSIRIS PURE FANTAISIE is scheduled in 2008. Ligularia Osiris Café Noir has the same leave-shape as Ligularia Osiris Fantaisie. It, however has brown/green foliage. Ligularia Osiris Pure Fantaisie has the same characteristics as Ligularia Osiris Fantaisie. This variety, however, is a variegated one. LIGULARIA OSIRIS EVOLUTION is a well chosen name. It has round shaped leaves which are light-yellow coloured in Spring. The colour of the leaves evolves to yellow-green in Summer and to darker green in Autumn. LIGULARIA OSIRIS PISTACHE has green leaves with typical and strange hardly to describe blotches on it. Thanks tothe plant breeding work of Serge, we may expect interesting brand new and improved Ligularia varieties in the years to come.